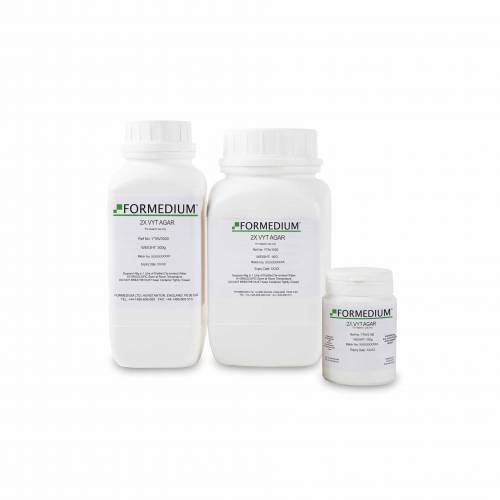 Formedium has added six vegetal media to its range of culture media for growth of E. coli. In all six vegetal media, Tryptone has been replaced by Soya Peptone, for the following formulations of LB Miller medium, LB Lennox medium and 2YT medium. 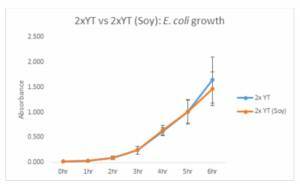 Tryptone and Yeast Extract are present as a general nitrogen source for growth and protein expression. Both are excellent sources for nitrogen and additionally Yeast Extract provides B-type vitamins, carbohydrates and growth factors. In vegetal media and avoiding any contamination of medium with constituents of animal origin, Tryptone is replaced by Soya Peptone. In contrast to Tryptone, which is a pancreatic digest of bovine milk casein, its replacement Soya Peptone is made by Papaic hydrolysis of Soya Bean meal. Nitrogen content of Soya Peptone (9.5 %) compared to Tryptone is slightly lower and the same for its amino nitrogen content (3 %). This difference of less than two percent and does not influence growth and protein expression notably. 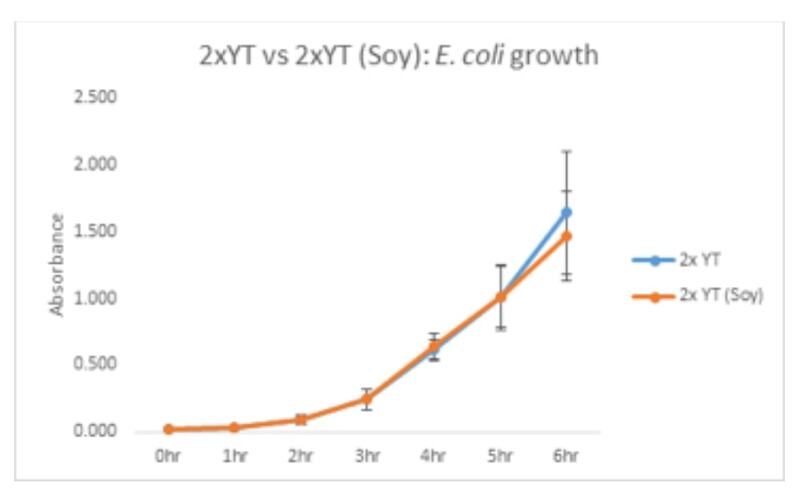 A comparative study between the use of Tryptone as a nitrogen source and Soya Peptone as an alternative source showed no difference in growth. 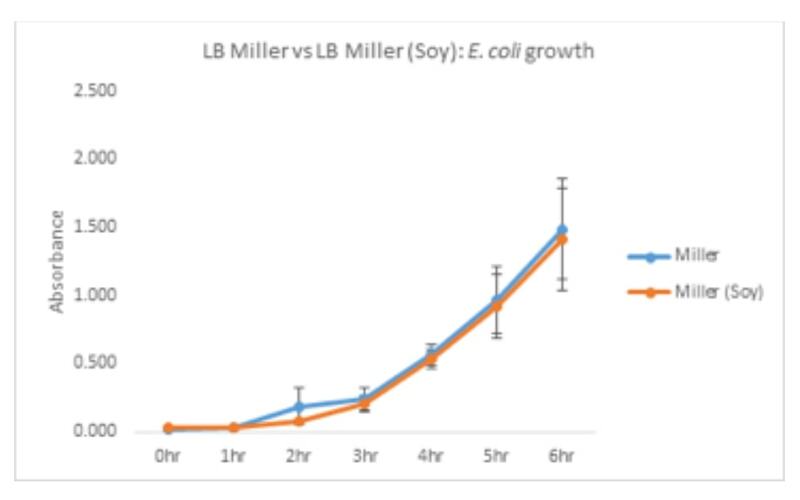 In liquid media cell growth of E. Coli is measured by optical density at 680nm this did not show any significant variance between growth curves of cells cultured in LB Miller Broth, LB Lennox Broth and 2YT Broth medium containing Tryptone or Soya Peptone. 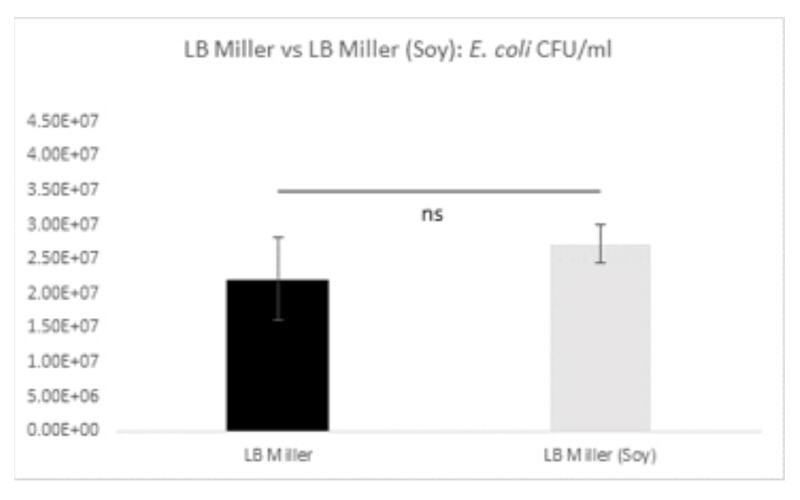 In solid media counts of Colony Forming Units (CFU) of LB Lennox Agar, LB Miller Agar and 2YT Agar containing Tryptone or Soya Peptone did not significantly differ from each other. No substantial difference could be noted between media containing Soya Peptone and Tryptone. 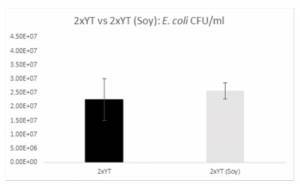 Soya Bean Peptone performed as well compared to the use of Tryptone in both liquid and solid media. No raw material sourced or derived from animals are used in the manufacture of this product. The materials used in the production are in compliance with the European directive 75 / 318 / EEC as amended by Directive 1999 / 82 / EC. Therefore Formedium Ltd. takes the position that this product is free of any risk in terms of Bovine Spongiform Encephalothy (BSE) or Transmissible Spongiform Encephalopathy (TSE). 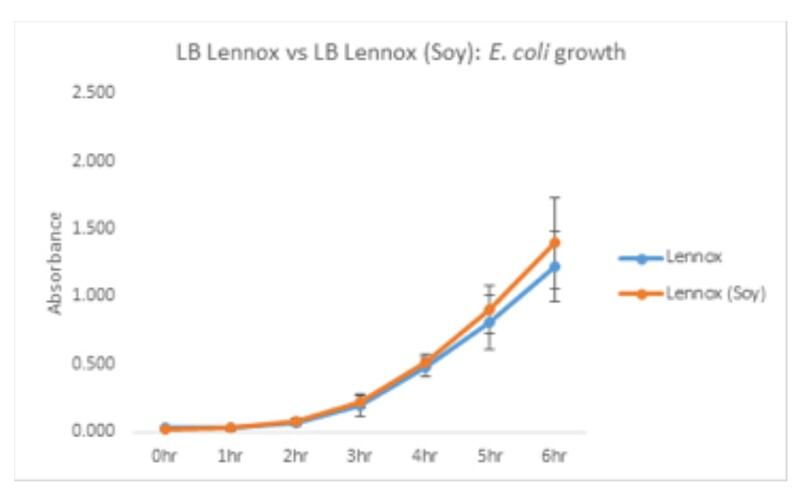 Broth culture: Cell growth was measured in LB Lennox, LB Miller and 2YT medium. Each medium was present in a formulation containing Tryptone or Soya Peptone. Single colony incubated in 5 ml of all three media tested (3 Tryptone vs 3 Soya Bean peptone) O/N @ 37 °C 180 rpm. 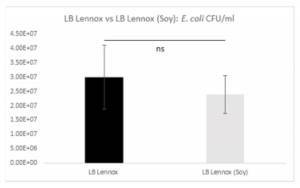 LB Lennox (g/l); Soya peptone 10 or Tryptone 10, Yeast extract 5, NaCl 5. LB Miller (g/l); Soya peptone 10 or Tryptone 10, Yeast extract 5, NaCl 10. 2YT; (g/l); Soya peptone 16 or Tryptone 16, Yeast extract 10, NaCl 5. Agar culture on plates: The number of Colony Forming units was measured in LB Lennox, LB Miller and 2YT Agar plates. 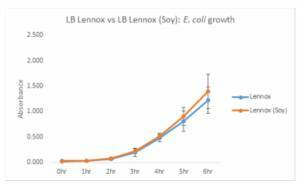 LB Lennox (g/l); Soya peptone 10 or Tryptone 10, Yeast extract 5, NaCl 5, Agar 15. LB Miller (g/l); Soya peptone 10 or Tryptone 10, Yeast extract 5, NaCl 10, Agar 15. 2YT; (g/l); Soya peptone 16 or Tryptone 16, Yeast extract 10, NaCl 5, Agar 15.